Note: The following is a reproduction for the web of a journal article, “The Department of Surgery, University of California, San Francisco by Pamela Derish M.A. and Nancy L. Ascher, M.D., Ph.D. The article spans the history of the Department from the 1860s to 2005. The article is reprinted from Arch Surg/ Vol 140, Dec 2005 www.Archsurg.com with permission from the American Medical Association, 2005;40: 1143-48. In 1898, the school moved to its present location in Parnassus Heights, overlooking Golden Gate Park. The land was donated by former city mayor Adolph Sutro, in part as an expression of gratitude for the medical education his daughter had received from the “Medical Department” of UC (Figure 2A).2 After the disastrous 1906 earthquake damaged or destroyed most of the city’s existing hospitals, the urgent need for medical facilities necessitated remodeling the medical school building so that it could serve as a hospital. The first UC Hospital opened in 1907 (Figure 2B), under the direction of surgeon Harry Mitchell Sherman, MD. Wallace I. Terry, MD, another California native, became chair in 1912 when the Medical Department was renamed the UC College of Medicine. By 1915, the college was officially designated the UC Medical School. In a tragic reflection of that time, the last Yahi Indian was found starving in Oroville, Calif. He eventually was brought to live at the UCMuseum of Anthropology at Parnassus, where he was named “Ishi,” the Yahi word for “man.” University of California surgeon and outdoorsman Saxton Pope, MD, (Figure 3A) became his physician and close friend, shooting bows and arrows with him in Golden Gate Park and learning the skills of game hunting. Pope, who became an expert in Yahi culture, later wrote a book about Ishi’s medical history and several books about archery. 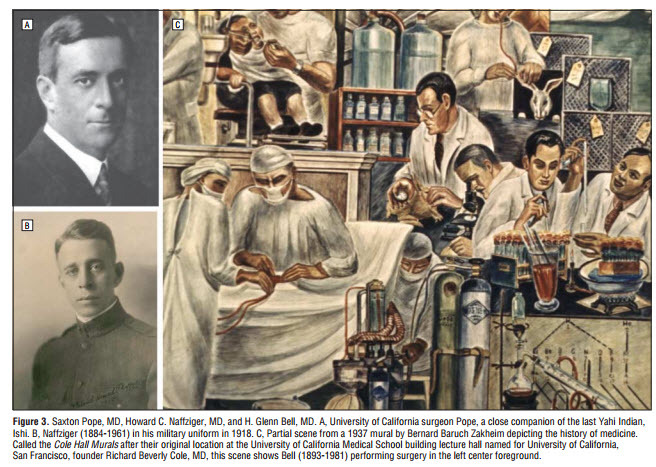 During that time, Harold C. Naffziger, MD (Figure 3B), under whose dynamic leadership the department would gain national prominence, had returned to UC to teach and develop a first-class surgical center. Naffziger was born in the mining town of Nevada City, Calif—another legacy of the Gold Rush. He had served as intern and resident surgeon at the UC Hospital and obtained the position of assistant resident surgeon at the Johns Hopkins Hospital in Baltimore, Md, working under William Stewart Halsted, MD, and Harvey Cushing, MD. Naffziger contributed perhaps more than anyone to the national reputation that the UC Medical School now enjoyed. When Naffziger succeeded Terry as chair of the Surgery Department in 1929, he developed a residency program modeled after Halsted’s with the help of H. Glenn Bell, MD, a general surgeon who had been chief resident under another Halsted resident,Mont Reid, MD, in Cincinnati, Ohio. Naffziger wanted residents to experience basic science as part of the curriculum and established the first research laboratory on the Parnassus campus. One of those residents was Edwin “Jack” Wylie, MD, a pioneering giant in vascular surgery, who, in 1951, was the first in the United States to perform thromboendarterectomy for a the ros c l e rot i c aor – toiliac occlusive disease. In 1951, UC established a medical school in Los Angeles, the first of 5 new medical schools in the UC system. 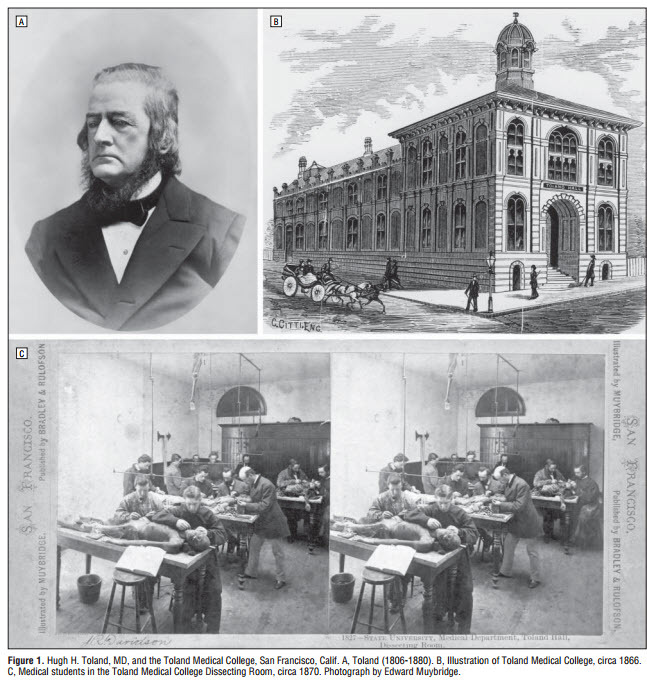 The oldest UC Medical School became distinguished as the UC, San Francisco (UCSF). During the tenure of Leon Goldman, MD, as chair of the Surgery Department from 1956 to 1963, pioneering contributions to vascular surgery continued to be made, including the first axillofemoral artery bypass in 1962. Experimental and clinical gastrointestinal research continued, and some of the earliest transplantationexperiments in discordant and concordant species were conducted, which helped set the stage for further investigative and clinical efforts in xenotransplantation. Endocrine surgery was a personal legacy of Goldman. In the area of endocrine research, iodine deficiency, hyperparathyroidism, and thyrotropin binding were all being investigated. Vascular surgery research was focused on arterial autografts and visceral arterial atherosclerosis. The role of glycolytic intermediates and ramifications of total parenteral nutrition were studied in collaboration with the Lawrence Berkeley National Laboratory (Berkeley, Calif) and the UCSF departments of Microbiology and Immunology. Transplantation activities accelerated rapidly: the first liver transplant at UCSF was performed in 1988, followed by thoracic organ transplants in 1989, a pancreas transplant in 1989, and a heart-lung transplant in 1991. Laparoscopic surgery also accelerated rapidly, beginning with the first laparos copi c chol e c y s t e c tomy , performed in 1990, which was followed just months later by the first UCSF laparoscopic cholecystectomy course and expansion of the laparoscopic repertoire to Taylor vagotomies, appendectomies, and the excision of liver cysts. Vascular surgeons began exploring minimally invasive approaches to treating aortic a n e u r y sms. Wo u n d – h e a l i n g r e – search received a 5-year, $3 million NIH grant to study collagen synthesis and angiogenesis. The newly organized UCSF Fetal Treatment Center began an NIH-funded study of fetal surgery for diaphragmatic hernia and controlling preterm labor. A merger with Mount Zion Hospital (San Francisco), a voluntary, nonprofit hospital in operation since 1887, began a new era in thoracic and oncology surgery when UCSF/ M o u n t Z i o n b e c a m e a n N I H – funded comprehensive cancer center in 1993-1994. The SFGH campus of UCSF continued to be a major force in improving the care of trauma pa t i ent s .
Important clinical advances included using computed tomographic scans to evaluate blunt abdomina l injur y and nonope r – ative management of particular types of liver injuries. 12 San Francisco General Hospital also played a nationally prominent role in the surgical response to the human immunodeficiency virus epidemic, leading the nation in adopting new infectioncontrol procedures for surgery, including double gloving and using waterproof garments and face shields to prevent mucocutaneous exposure to blood. When Theodore Schrock, MD, assumed the chairmanship in 1993, after Debas was appointed dean of t h e S c h o o l o f Me d i c i n e , ma j o r changes in reimbursements had tightened their grip on the UCSF academic medical center, prompting a merger between UCSF and Stanford University (Stanford, Calif) in 1997. Although historically the 2 institutions had shared the staffing of SFGH and the VA Hospital for decades, this time the 2 faculties failed to come together and the merger was dissolved a year and a half later. The 1990s were also a time of great expans ion of the department’s already strong laparoscopic surgery efforts. Collaborations with bioengineers were forged to develop virtual-reality software and robotic dev i c e s t h a t wo u l d o v e r c ome t h e technical limitations of the instrumentation in current use. The Center for the Study of Gastrointestinal Mot i l i t y and S e c r e t ion a l so expanded, and fetal surgery continued full speed ahead. A few of the many milestones of this group included the ex utero intrapartum treatment procedure for airway obstruction in 1995, which has been performed more than 40 times for infants with various types of airway obstruction, such as congenital cystic adenomatoid malformation, cystic hygroma, and tracheal obstruction; completion of an NIHsponsored clinical trial for open repair of a fetus with congenital diaphragmatic hernia in 1996; fetal endoscopic (fetoscopic) surgery in 1996; successful resuscitation of a fetus during open fetal surgery for sacrococcygeal teratoma in 1996; an NIH trial of a fetoscopic balloon for congenital diaphragmatic hernia in 1998; and percutaneous radiofrequency ablation of a sacrococcygeal teratoma in 1999. Since Nancy L. Ascher, MD, PhD, became chair in 1999, solid organ transplantation has taken place in patients with human immunodeficiency virus, adult live-donor liver transplantation has joined adult-tochild for transplantation procedures, a new center for patientd i r e c t e d b r e a s t c a r e h a s b e e n developed, and a multicenter clinic a l t r i a l of adjuv ant the r apy of colorectal cancer has been conducted. Other important advances over the last 5 years include the development of a novel endovascular treatment for vascular and abdominal vascular disease, fetal endoscopic laser treatment of a single arteriovenous communication in twin-twin transfusion syndrome, and initiation of a pancreas islet program. An affiliation has been established with the East Bay Surgery Residency Program, centered at Alameda County Medical Center (Oakland, Calif). Today, the mission of the UCSF Department of Surgery is 3-fold: to develop the next generation of leaders in surgery; to provide outstanding quality clinical care that is both compassionate and cost-effective; and to make significant advances in scientific knowledge and clinical practice through both basic and clinical research. The “crown jewel” of our department is our residency program, consistently ranked among the top 10 programs in the nation. More than 80% of graduates from the past 30 years have continued in fellowship programs, and almost half become surgical academicians associated with university departments of surgery. Residents rotate through our flagship hospital, Moffitt/Long Hospital, a quaternary care center and major university research hospital; SFGH, San Francisco’s municipal hospital and its only level I trauma center; the San Francisco VA Medical Center, a referral center for other regional VA hospitals; the UCSF/Mount Zion Hospital, a regional cancer center; the San Francisco Kaiser Permanente Hospital, a large health maintenance organization; and the California Pacific Medical Center (San Francisco), a privatepractice clinical setting where our residents train with private community-based surgeons. This combination of hospitals gives residents broader exposure to clinical surgery than any other program in the country. Basic and clinical research by faculty, fellows, and residents is fundamental to our mission. We provide the opportunity for residents to engage in research activities for 2 to 3 years. Surgical residents can work in the laboratories of leading basic science researchers throughout the university. We also offer strong clinical research opportunities in gastrointestinal surgery, transplantation, trauma and sepsis, vascular disease, cancer, fetal treatment, and wound healing. University of California, San Francisco, was the fourth largest recipient of NIH research dollars in 2004, receiving a total of $438.8 million. The department includes 85 full-time faculty in its 9 divisions, including 15 basic scientists. 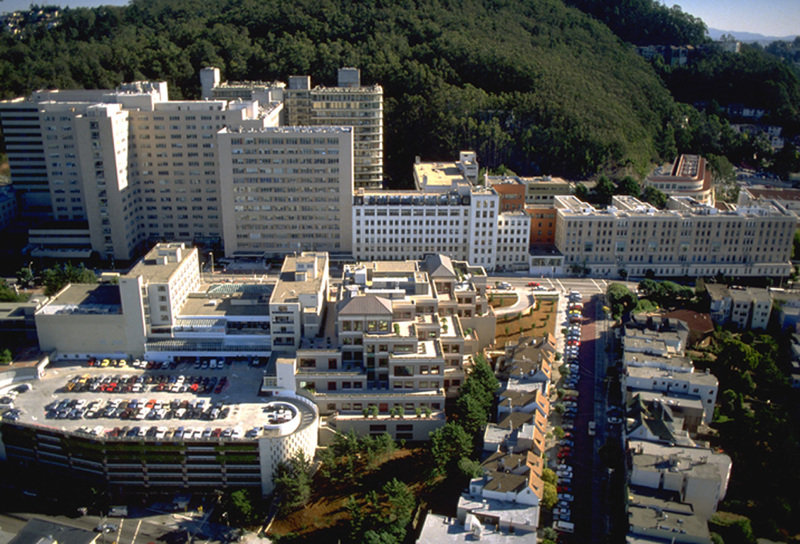 These divisions, which oversee resident and student education, clinical activities, and research, are Adult Cardiothoracic Surgery, Pediatric Cardiothoracic Surgery, General Surgery, Fetal Surgery, Pediatric Surgery, Plastic and Reconstructive Surgery, Transplantation, Trauma (at SFGH), and Vascular Surgery. Recognized nationally and internationally, our division chiefs and faculty have served as officers of major surgical societies, members of specialty boards, and members of study sections at the NIH. Many of the clinical services and individual faculty are rated as being among the “top 10 in patient care” in the nation. Correspondence: Dr Ascher, University of California, San Francisco, 513 Parnassus Ave, S-322, San Francisco, CA 94143-0104 (aschern @surgery.ucsf.edu). Acknowledgment:We thank Nancy Rockafellar, PhD, of the University of California, San Francisco, Oral History Program, Department of Anthropolog y , Hi s tor y , and Soc i a l Medicine, and Valerie Wheat, BA, MLS, of the University of California, San Francisco, Archives and Special Collections, for help in researching information for this article. 1143, ©2005 American Medical Association. All rights reserved. 1. 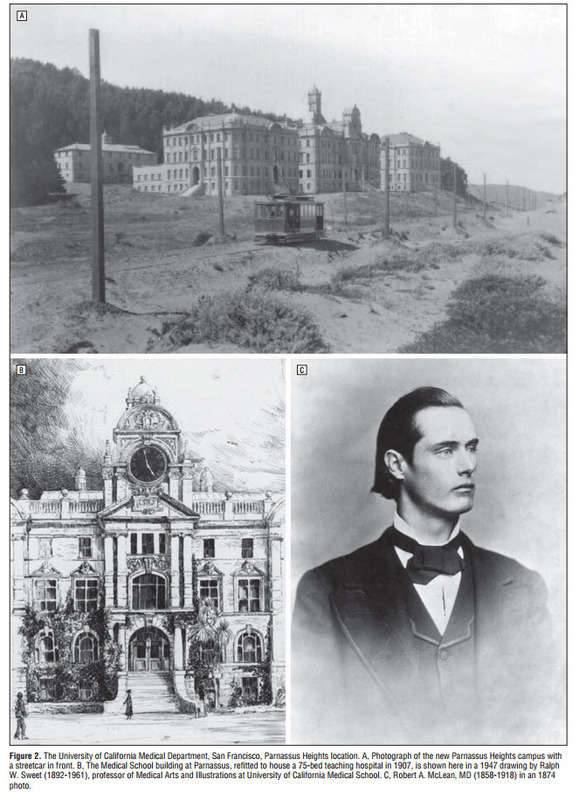 A history of the UCSF School of Medicine. Available at: http://history.library.ucsf.edu. Accessed June 14, 2005. 2. San Francisco: historical overview. University of California History Digital Archives Web site. Available at: http://sunsite3.berkeley.edu/uchistory /general_history/campuses/ucsf/departments_s .html. Accessed June 14, 2005. 3. Blaisdell FW, Grossman M. Catastrophes, Epidemics and Neglected Diseases. San Francisco General Hospital and the Evolution of Public Care. San Francisco, Calif: The San Francisco General Hospital Foundation; 1999:39. 4. In memoriam: Howard Christian Naffziger. University of California History Digital Archives Web site. Available at: http://sunsite.berkeley.edu /uchistory/archives_exhibits/in_memoriam/index3 .html. Accessed June 14, 2005. 5. Rosegay H. A history of neurological surgery at the Uni v e r s i t y of Ca l i forni a , San F r anc i s co. Neurosurgery. 1996;38:794-805. 6. In memoriam: H Glenn Bell. University of California History Digital Archives Web site. Available at: http://sunsite.berkeley.edu/uchistory/archives _exhibits/in_memoriam/index3.html. Accessed June 14, 2005. 7. Interviews With J. Englebert Dunphy, MD, UCSF Oral History Program, Department of Surgery Interview Series 4. UCSF Surgery in the Postwar Years. Building an Exemplary Department of Surgery. San Francisco: The Regents of the University of California; 2000:11. 8. Way LW. A festschrift for John Englebert Dunphy, MD. Am J Surg. 1978;135:273-275. 9. In memoriam: J Englebert Dunphy. University of California History Digital Archives Web site. Available at: http://sunsite.berkeley.edu/uchistory /archives_exhibits/in_memoriam/index3.html. Accessed June 14, 2005. 10. Interviews With Paul A. Ebert, UCSF Oral History Program, Department of Surgery Interview Series 5. UCSF Surgery in the Postwar Years. Uniting Pediatric Cardiology and Congenital Heart Surgery. San Francisco: The Regents of the University of California; 2000:xxii. Downloaded from www.archsurg.com at UCSF/Library, on December 20, 2005. Copyright © 2005, American Medical Association. All rights reserved.